talent |ˈtalənt|noun1 [ mass noun ] natural aptitude or skill: he possesses more talent than any other player | [count noun ] : she displayed a talent for garden design.• people possessing natural aptitude or skill: I signed all the talent in Rome | [ count noun ] : Simon is a talent to watch. Bel came home, buzzing, from school last week. She had tennis try-outs and got to witness a pip-squeak, 11-year-old, who has just started Year 7, rally and beat the Year 12 champion; a girl 5 years her senior and an Interstate player. “She is soooooo talented Mum! You should have seen her. ” All I could envision was the sacrifices that child’s family have made, the hours and hours of training involved, the money…Oh boy, the money that has been spent on getting a child to this level of expertise at such a young age; and of course the natural ability the girl would have started with. It got me thinking about talent, what it is , where it comes from. Over the years, in my quest to understand how to be more creative, to do better with my art, to grow as an artist, I have read quite a few motivational and inspiring books. 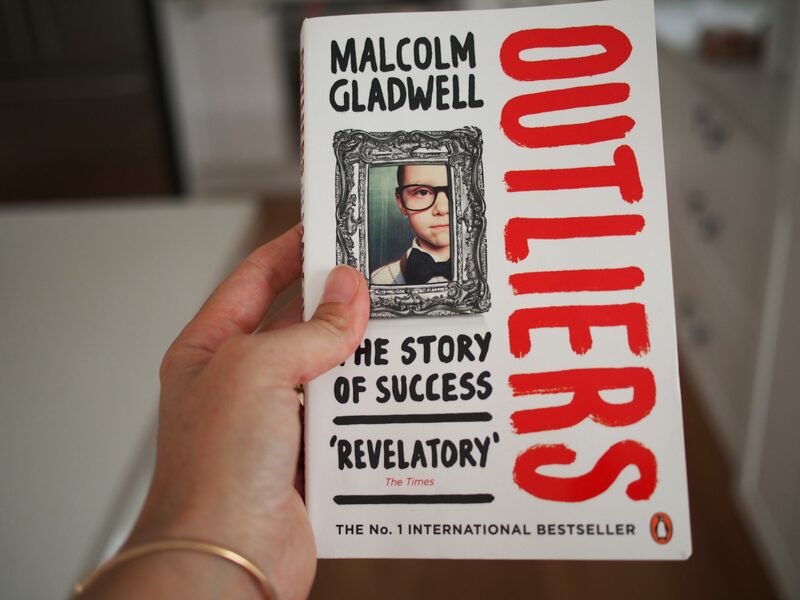 An extremely interesting one of late has been “Outliers” by Malcolm Gladwell. It’s the ‘story of success’. It’s opened my eyes to what ‘talent’ really is…and it has inspired me to work harder and smarter and to feel over the moon grateful that I can pursue this dream of mine. In “Outliers”, success is explained as more than natural ability, more than intelligence, more than personal qualities. People are not mediocre one day, and successful the next. It boils down to circumstances, hidden advantages, opportunities, where they grew up, how they grew up and basically what we do, right here, right now, that shapes what we achieve. Success, isn’t all about chance, it’s also about time, hours of commitment, and what Gladwell describes as the “10,000 hour rule.” 10,000 hours of practise makes perfect. Ten T. H. O. U. S. A. N. D. It will take me ten thousand years to get even a thousand hours clocked off. Oh dear. “You are so talented”. I’ve read this a couple of times on my blog and Facebook page lately. While it’s definitely a lovely, joyous sentence to read and helps me to feel I am finally getting something right, it’s also very humbling. 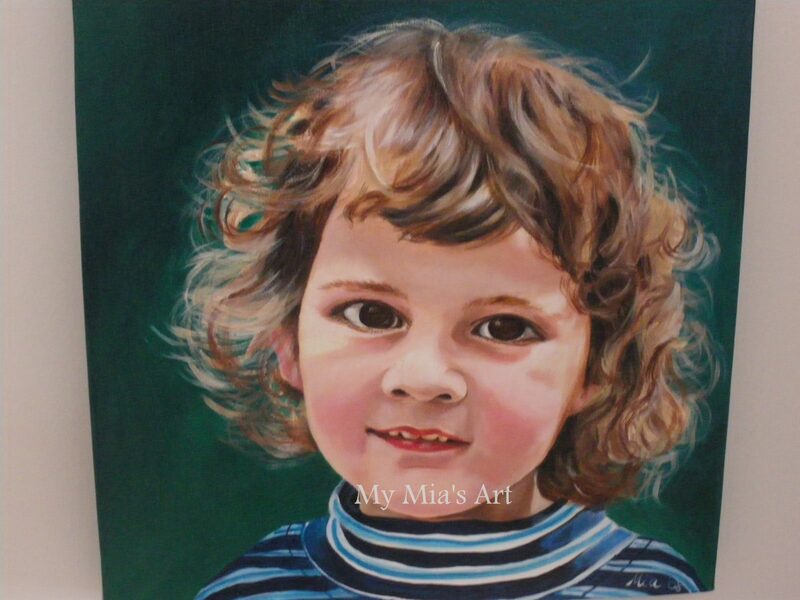 I believe I only possess a minuscule amount of natural talent, and that the success of SOME of my paintings now (and I have a million miles to go, to be successful in all of them) is more about being blessed with the right circumstances from a very young age and right now, today, as a Mum that paints. Let me explain…As a child I loved to create. Most kids do. Who doesn’t know a little kid who isn’t happy with a wad of paper and a crayon in his hand? My parents encourage this, just as the young tennis champion is, surely, being encouraged by her own parents. When they realised she had good, natural, hand – eye coordination and that she could actually hit a small yellow ball with a racquet, they got straight onto encouraging it…that simple. I have photos of me, age 3, lying in the shade on a hot summers day, colouring in. Knowing I liked drawing, that I had a natural aptitude for scribbling and general mess making – and that it kept me quiet (!) I was given more art materials. Christmas and birthdays were made easy for my parents…packets of textas, watercolour tins, paper. Easy gift giving… and encouragement. When I reached school age, we had a Headmaster with an interesting way of disciplining…it was all about reverse psychology in the 70’s! Whenever I got into trouble (I was a real tom-boy back then and had a few fun times rolling down the grass slopes at school!) after the inevitable lecture of behaving and following school rules, Mr O’Hara, bless his soul, would give me a coloured pencil – any colour I wanted, chosen from the glass jar on his table. That jar, I can just picture it now, was plentiful and the pencils were those divine, chunky pale wood ones…well, as you can imagine, I plotted my way to gaining a few new ones regularly! Once again…art was given a chance in a round about way! In upper primary school, I just happened to make friends with a girl whose mother was an artist…she was practising to become an art teacher – she gave us art lessons once a week – for free. Bonus. Another circumstantial chance. After doing Year 12 art, where I was very low down on the school’s high achievers ladder and having a horrendous few years of art teachers who were not so great at encouragement, I had absolutely no thoughts of pursing art in any form. This all changed after a back packing year in London in my early twenties, where I worked as a nanny. I was introduced to children’s literature….the daily reading of picture books was a new-found joy! I spent the cold winter evenings, in the loneliness and solitude of my attic garret pouring over these picture books, copying, practising, reading and writing. I bought a (snail mail) writing course with my earnings and studied at night. The family I worked for bought me a boxed watercolour set as a leaving present. I treasured that box as a celebration and approval of my art pursuits. I still have it. It’s a reminder of humble beginnings and happy memories. Circumstances pushed me to enjoy art, but even at this stage, art was just a hobby, a fun thing to do. I was giving it more time though and so slowly I got better at it. I was starting to add up those 10,000 hours, one small minute at a time. Shortly after meeting Dudie, who was on a back packing holiday around Australia, from Scotland, he left to finish his world travels. I was left feeling sad and dejected and counting down the months until he was going to hopefully ( he left me his watch as a promise!) return to Perth. To fill in the time and to save money, I stayed home from the pubs and clubs and painted. Again, practise makes perfect. A little while after Dudie returned to live in Perth (he loved his watch a lot it seems!) he applied to art college on my behalf. I had absolutely no idea he had done so until I was asked to take my portfolio in for an interview! Portfolio? I didn’t have one, I had never even considered art college. I was 26, working full-time in retail, we had just bought a house and it just didn’t seem a logical step in my career, or life. So, with a great shove from my Mum and Dudie, I scrapped together a pile of illustrations from various years and voila…I was in. I lasted a year. A year of them trying to teach me to draw, paint and sculpt…I made great friends, I got married, I had fun, but at the same time I felt that I was an art school interloper. I wasn’t very good at any of it…I didn’t look, act or feel very ‘arty’. I wanted to be a children’s book writer and illustrator, not an ‘Artist’. I left to have my Bel and that was that. 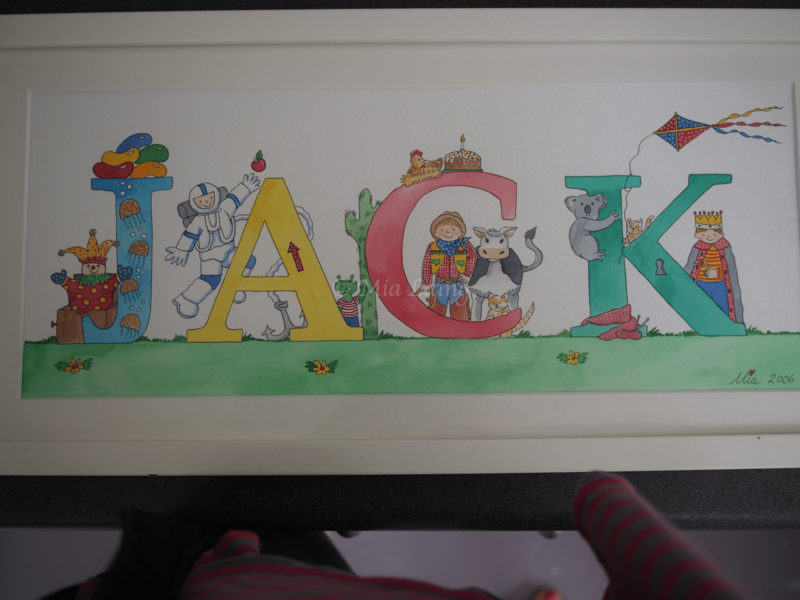 I did hundreds of these, commissioned for children’s bedrooms. They were very popular…and time consuming…and did my head in! After many years of raising children, pursing illustration and getting nowhere, I tried canvas painting as a means of clearing the negativity out of my head. I felt a failure. I was a tired, bewildered young Mum, trying to break into a cut throat industry. I didn’t have the thick skin, the courage, or the supposed ‘talent’ to break into children’s illustration. One step forward, two steps back, doors kept closing in my face. I felt drained and I hated it. 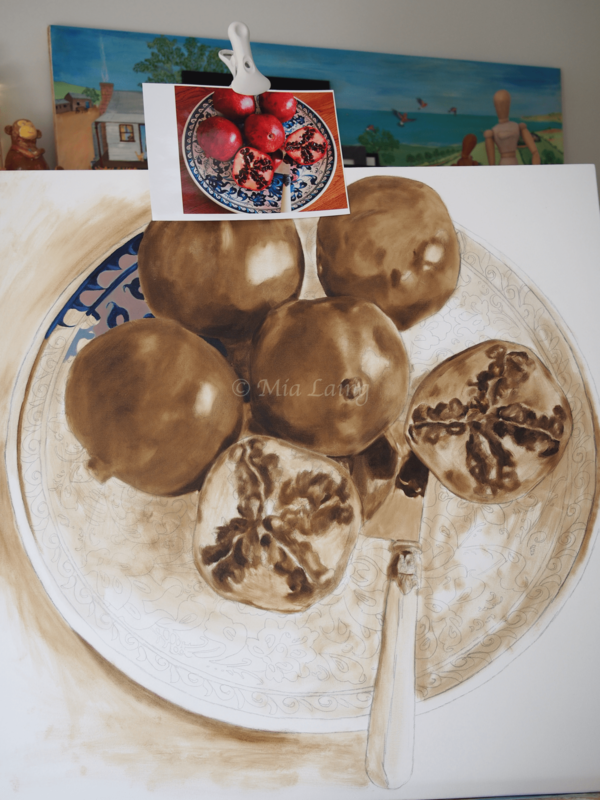 So, I signed up for a term at a local art class, in acrylics, and here I am 5 years later, painting (almost) full time….and blogging (Chuckle) about my art. Hilarious! 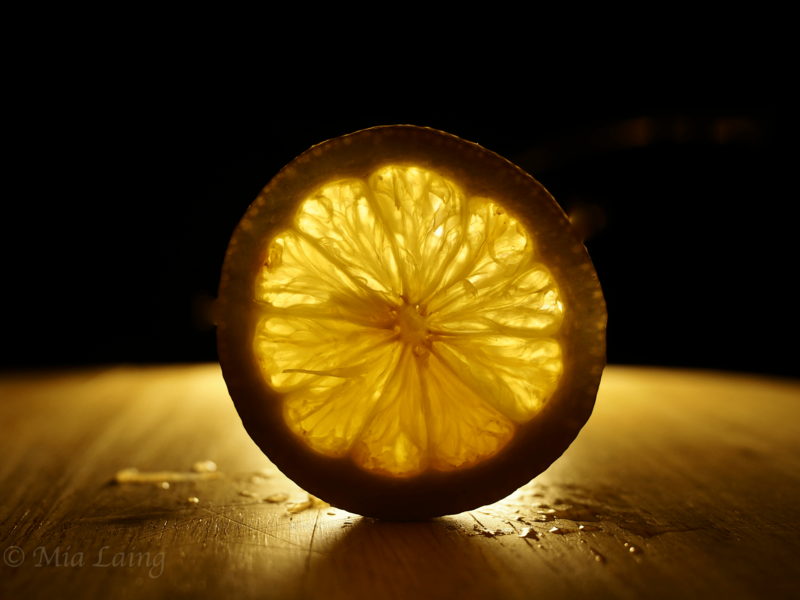 One of Bel’s photo’s for a school project. she is, circumstantially, been given the ability to be successful at her own pursuits and is clocking off her own 10, 000 hours. She’s also good at maths…natural talent? No…Dudie is a Financial Planner. Maths is his game. I truly, 100%, believe everyone can be creative; anyone can learn to paint, to draw, to create , to craft, if they are given the opportunity . That chance may be carving out more time from the general craziness of life; squirreling away money for art materials ; seeking access to lessons, or just plainly and simply, giving yourself the thumbs up to do so. I’m lucky…I have a supportive family, money to buy materials, a hard-working husband who has given me the ability to stay home and raise our girls, which has therefore given me the time to pursue my creative side. Believe me, it hasn’t always been an easy journey. I’ve fought a return to paid employment for many years. I’ve lost a small part of my sanity and quite a few friends through the solitary nature of this pursuit and I often question my abilities and whether I should even be doing this, at times ridiculous, barely paying career. So, my message to you, IF you want it, get out there…work out where your abilities lies. Take a good hard look at where you have come from and where you can go with some hard work, determination and practise. Take all the chances you have been given and are yet to arrive, and use them. Never say never. I’m working my way through those chances and opportunities and darned 10,000 hours of practise…one brush stroke at a time. So inspiring to read about your perseverance and all of the bits that helped it come together, but also celebrate your part in allowing it to come together. So hard not to give up and it feels good reading about someone who didn’t and is producing such beautiful work now because of it. Thank you so much Jennifer. It sure is a journey that we go on when we pursue any dream. It is nice to know there are others going through it and that we can all help in the trek to the end. Thank you, once again, Lillian for the support you always show. Glad it is encouraging to you, as that was my hope when I wrote this week..keep on keeping on!! Previous It’s Just Not Happening…Yet.